How Much Does It Cost To Start a Laundromat ? There’s always a business opportunity in people’s need for fresh, clean clothes. So if you’d ever want to open a laundromat, how much will this actually cost you ? Right from the start you have to know that the whole investment will be anywhere from $100,000 to $500,000. You can always start a home-based, full-service laundry business, instead of the normal coin-operated laundromats. This business model, although cheaper to start, will also bring in less in profits and will be harder to scale up. The upside is that you’ll only need $200 to $5000 to get everything you need, meaning a heavy-duty laundry machine and dryer. Nevertheless, the total figures for opening a coin-operated laundromats will differ greatly, depending on a few factors like size and location. Let’s consider the factors below to get a more realistic approximation of the final costs. To start with, look for the perfect location for your laundromat and be prepaired to incur some construction costs. Be prepaired to spend quite a bit on upgrading electrical circuits, carpentry, plumbing, sewer lines and drainage development, upgrading of the electrical circuits and gas lines upgrading of an already existing building. If you’re trying to start a small laundromat, just the construction upgrade costs will be anywhere from $100,000 to $200,000. The cost of starting a laundromat includes the purchase price or lease price for coin-operated washing and drying machines. These may range between $150,000 to $450,000 depending on brand name, sophistication, size, and strength. You may also need coin change machines, industrial-size folding tables, laundry carts, utility sinks, and vending machines as part of your laundromat equipment costs. Your laundromat, like any other business, will neeed to be licensed, the licenses required may include a health department permit for food or snacks, building permits during the construction phase, a water and air pollution control permit, a fire department permit and a sign permit depending on the city you plan to start your business in. Always be sure to check for any permits and licenses you’ll need before you start investing. These costs will all add up to anywhere from $200 to $8,000 per washing machine, which will be a lot, especially if you plan to have a big laundromat. In terms of personel, a laundromat won’t need a big staff. Be prepaired to hire someone to open up and close up daily, a cleaner and someone to repair and maintain various machines and fix whatever will need fixing. If you also want to offer dry-cleaning services, then you’ll also need a dry-cleaner and you should hire some of the staff members on a salary, rather than wages. Add up the costs of staff needs to the final costs. Looking For Another Business Opportunity ? How About Opening A Coffee Shop ? Many starting entrepreneurs don’t have enough money to start their dream business, you take into account the possibility of borrowing if you think you might have slightly less than needed. A cheaper option for you would be to look for an investor, seeing that it will be a lot easier for you to give someone a share of profits rather than pay monthly interest on the loan. Don’t go for a lot of investors, because this will diminish your profits greatly, even if they give you enough money to start with. Amongh the most expensive financiers will be the manyfacturer of the laundry equipment, due to the fact that they usualkly have the highest interest rates. If you’re looking to get a loan to start a business, be sure to add up interest rates when calculating your final costs. 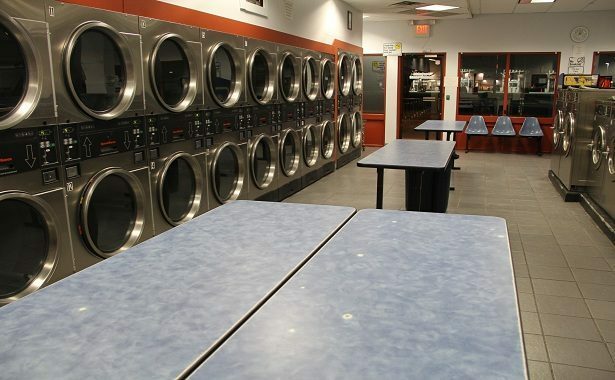 Many new laundromats offer convenience services to attract customers. A nice idea would be to add internet connection and electric sockets for people to be able to work on their computers while they’re waiting for their clothes. Also food and snacks help. Having video games, pinball machines or mounted televisions would also be fun for customers. Vending machines also work. You could attract busy people by having a vehicle for deliver services. Although these will bring in more customers, they will add up to the initial cost too. So be sure you get your numbers right before investing your life savings. Should the average working Joe start a laundromat business ? If you added your numbers and you have money to cover most of the costs, then starting a business could be a great opportunity for you. On the other hand there might be a problem if you have a great idea, but you have no real funds to invest in it. Finding investors to cover all of the expenses or getting a loan for the full sum might end up being a disaster. Too many investors could take all of your hard earned profit while big loans could mean interests bigger than your profits. Always be sure you have added up any costs that might pop up and think of everything that’s at stake before startning your dream business. https://www.thepricer.org/wp-content/uploads/2015/03/cost-of-starting-a-laundromat.jpg 380 615 qSign http://www.thepricer.org/wp-content/uploads/2016/11/pricerlogonew.png qSign2015-03-27 00:12:562015-04-23 00:29:29How Much Does It Cost To Start a Laundromat ? How Much Do The Most Expensive Gadgets Cost ? How Much Does Treatment in a Sleep Center Cost?